This recipe is very special to me as this is my 200th post. ; heartfelt thanks to all my readers and friends who all are encouraged me to keep going! Here is special recipe to celebrate this occasion; this delicious cake with a molten runny center is the ultimate chocolate treat especially for kids! and this recipe is adapted from Show me the curry. It is very yummy and easy to prepare also. Preheat oven to 200 deg C and prepare your ramekins or oven proof vessel (grease with butter / oil and dust it with all purpose flour); keep aside. Take microwaveable bowl add in the chopped dark chocolate pieces and keep it in a microwave oven ( 1 or 2 minutes is enough) or you can melt chocolate using double boiler method also. Once chocolate is melted, take it out and add in butter. Mix until the butter melts fully and allow to cool. In a separate bowl, beat the eggs with the caster sugar (powdered; until light and fluffy. Stir the chocolate butter mixture and then fold in flour. Divide the batter into the prepared ramekins or bowls until 3/4 way full and bake on preheated oven at 200 deg. C for 10 to 15 minutes. Remove from oven. You can serve the cakes in their molds itself or allow to rest for five minutes before inverting onto individual serving plate. (To unmould, run a knife around edge of the ramekins, turn upside down into the plate and serve). Top with vanilla ice cream, berries or relish as it is. 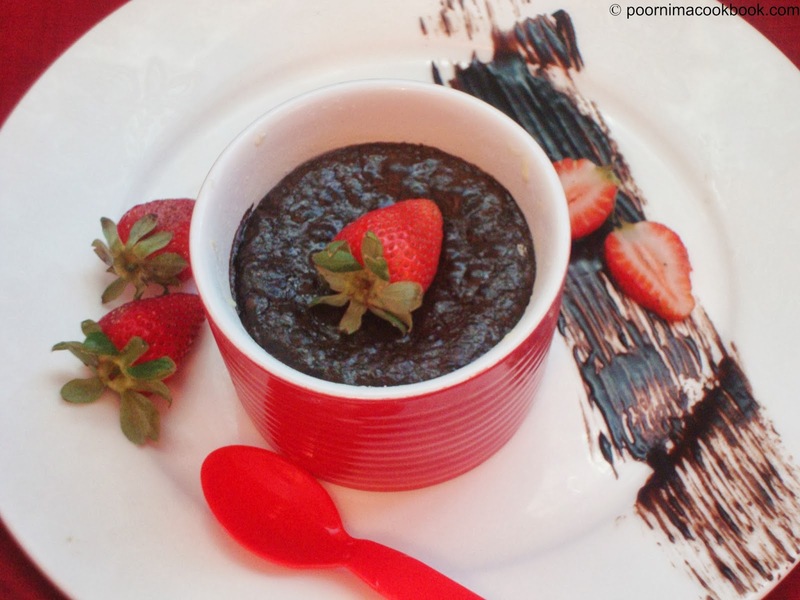 A best treat for chocoholics! 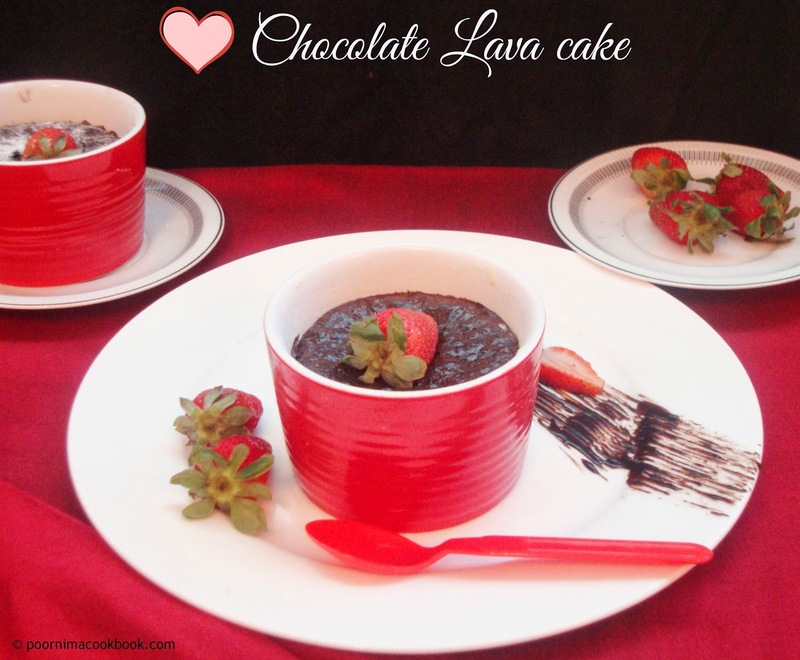 wow beautiful chocolate lava :) congrats on your 200 and wishing you many many more milestones. You are an amazing cook and love the new gourmet presentation. Congrats and the lava cake, perfect for the occasion..
tempting lava cake n congrats on ur milesstone!!! 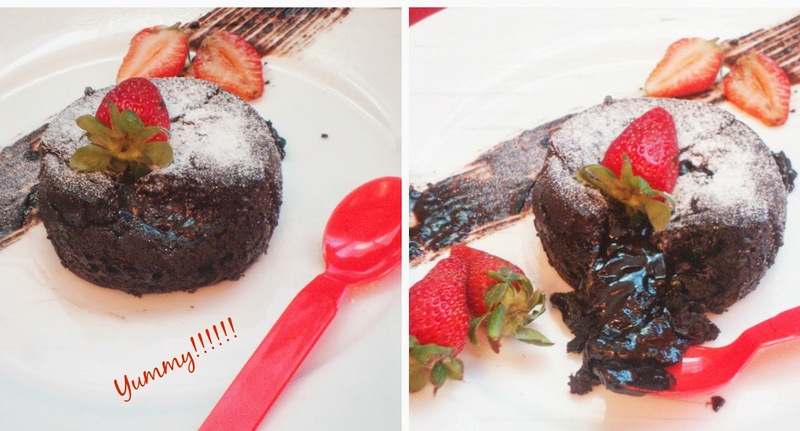 perfect cake for perfect occasion...congrats for 200th post..
Congrats on ur 200th post, molten chocolate cake is just simply out of the world..drooling here. Congratulations poornima for your 200 th post ,wish many more to come .Cake looks so goood nd so perfect for the celebration. Congrats.......Good choice to celebrate the occasion with "Molten Lava Cake"